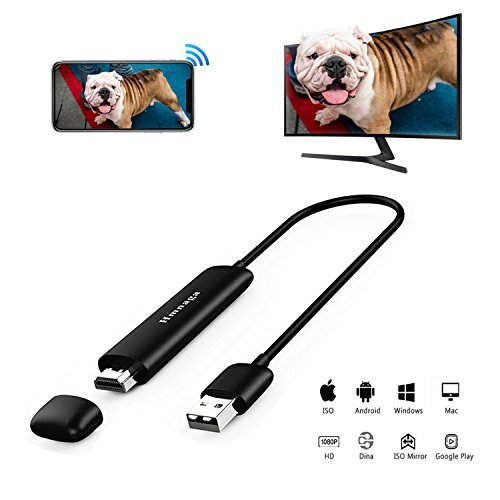 The Venoro 5G wifi wireless display dongle can transfer multimedia (Images, Audio, Video, Games) from your iOS/ Android smartphones and tablets, Windows/ MacOS PC to large screen TV, monitor or projector via WiFi connection. It is widely applied to home entertainment, business conference, teaching and training, etc. ✔100% Brand New and good quality,Passed CE FCC Rohs Certification. ✔Built-in hot spots, support 2.4 /5G technology that give smoother data transfer. ✔Support multi-screen interactive features like DLNA/Miracast/Airpaly. - Airplay/Miracast: Real-time display mobile phone screen to a big screen of TV, Projector. - DLNA: Enjoy watching video then you can free up your smart devices. - Supports WIDI / Chormecast. ✔Supports almost full-format 1080P H.265 decoder. ✔External WiFi antenna for stronger signal transmission, the maximum transmission distance can be up to 4m. ✔Lightweight and portable pocket size to carry. Support Andriod 4.2 and up system, IOS8.0 and up system MAC OS 10 and up system, windows 8.1 and up system. - We present an HDMI Cable that you can connect the adapter to the TV or monitor directly which don't need to buy it in other places. - Power adapter is 5V/1A at least so that ensures stable power supply. - Well works with Hulu Plus, HBO go, youtube, office, safari, chrome, facetime and others free APP, may not compatible with those app that require copyright, like Netflix/ iTunes/ Amazon Video. Real 5G Network Technical Streaming Media Player - Built-in hot spots, With 2.4G+5G dual-band technology, file transfer faster, video more HD, and No delay even for playing 3D big screen game. With new H.265 decoding tech, Support HDMI 1.4 port and 1080P HD output provides the perfect experience. Versatile - Support DLNA, Chormecast, Airplay Mirroring, Miracast. Wirelessly project what's on your tablet, laptop, or smartphone to your big screen. Enjoy movies, videos, photos, games, websites, PowerPoint presentations, and even Navigation map information on your HDTV Monitor or Projector for protecting your eyes and Getting the best user experience on big screen. Easy Connection, Plug & Play - The upgraded Dual-core supports Play more stable and Fluently. Etremely mini and lightweight design, easy to carry. No App or drivers required, only 3 steps to enjoy media files on large screen: Plug->Connect->Mirroring by using Miracast, DLAN and Airplay. We have text instructions to teach you how to operate. Powerful Compatibility - Support Andriod 4.2 and up system, IOS8.0 and up system MAC OS 10 and up system, windows 8.1 and up system.peration, even if your phone without miracast function. Japan Imported Antenna, Safe and Higher Speed - WiFI Antenna customized and imported from Japan, more penetrating power and transmission rate more faster. Stylish exquisite appearance with high-quality gold-plated HDMI surface, light weight and compact to carry. Any problem met on you pls contact us at anytime and and we'll be in ready to help.